Pilgrims is not a random title. 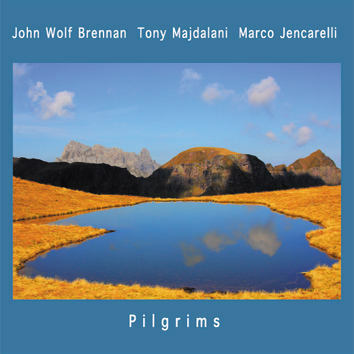 John Wolf Brennan - piano (and 10 other instruments), Marco Jencarelli - acoustic and electric guitars, Tony Majdalani - voice, percussion (and 10 other instruments) bring us on a musical trip which reflects a spiritual journey. Their pilgrimage is in many dimensions — geographical, spirituals, chronological and immediate. On the way, the three pilgrims visit many places, embrace many moods. Their 77 minute journey is accompanied by a 16-page booklet — quite a lot to read about.